Ernest Albert Waterlow was born in London and studied at Heidelberg and Lausanne. 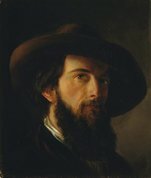 He entered the Royal Academy Schools in 1872 and went on to become an accomplished landscape painter, exhibiting widely and enjoying considerable success. 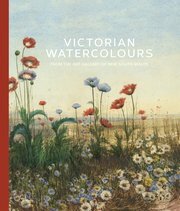 He was elected an associate of the Society of Painters in Water Colours in 1880 and a full member in 1894. He was president of the Society from 1897 to 1913. He also became a Royal Academician in 1903. Early in his career, Waterlow was impressed by the mid-Victorian Idyllists George Heming Mason and Frederick Walker but his mature works embody the naturalistic trend in 19th-century British art and reflect the influence of the French Barbizon School, which he experienced at first hand during a sojourn at Barbizon in 1895. Waterlow spent the summer of 1902 on the River Great Ouse in Huntingdonshire (now Cambridgeshire) discovering congenial subjects to paint around the villages of the Hemingfords and Houghton. His deep affinity for the tranquil river scenery of this area, with its quaint old houses, fertile meadows and ancient water mills, resulted in some of the artist’s most poetic and intensely felt landscapes, such as his limpid watercolour showing the mill at Hemingford Grey (demolished in the 1950s), which was exhibited at the Royal Society of Painters in Water Colours in 1904. Waterlow also exhibited an oil version of the same composition at the Royal Academy in 1902, showing the mill at a longer range across the light-dappled water. Waterlow’s versatility in the medium of watercolour is vividly demonstrated by the fluid, transparent brushstrokes and his understanding of the effects of light. The broad, soft-toned washes are painted with a loaded brush, imparting a breezy, outdoor feeling to the work. The Art Journal observed of Waterlow’s landscapes in February 1903, ‘there is about the finish of his pictures, both oils and water-colours, something of that delicious indecision and mystery which Mariette… calls une certaine vaguesse’. The use of scratching out with knife and brush end to accentuate detail and create highlights further enlivens the coloured surfaces.